The Haast’s Eagle (Harpagornis moorei) was the largest and most powerful bird of prey known to have ever existed and was the top predator of New Zealand throughout the Quaternary. It was large-prey specialist whose primary prey items were the flightless moa (Dinornithiformes), which could weigh up to 200kg. Eagle Roost, New Zealand. Gift of Phil Millener, 1983. The Haast’s Eagle was first described by German geologist Julius von Haast in 1872. 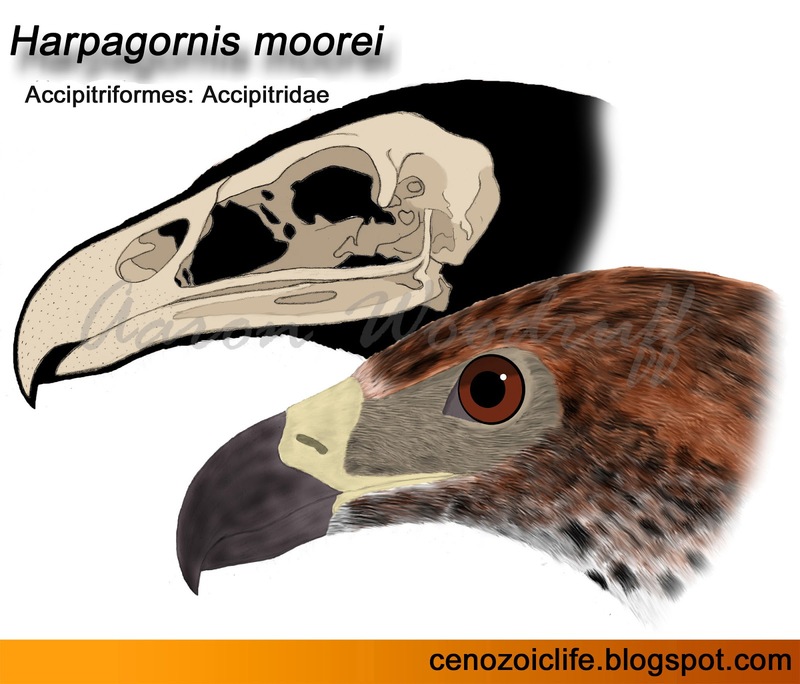 He named the bird Harpagornis moorei after the owner of the Glenmark Estate where the eagle’s bones had been found, George Henry Moore. 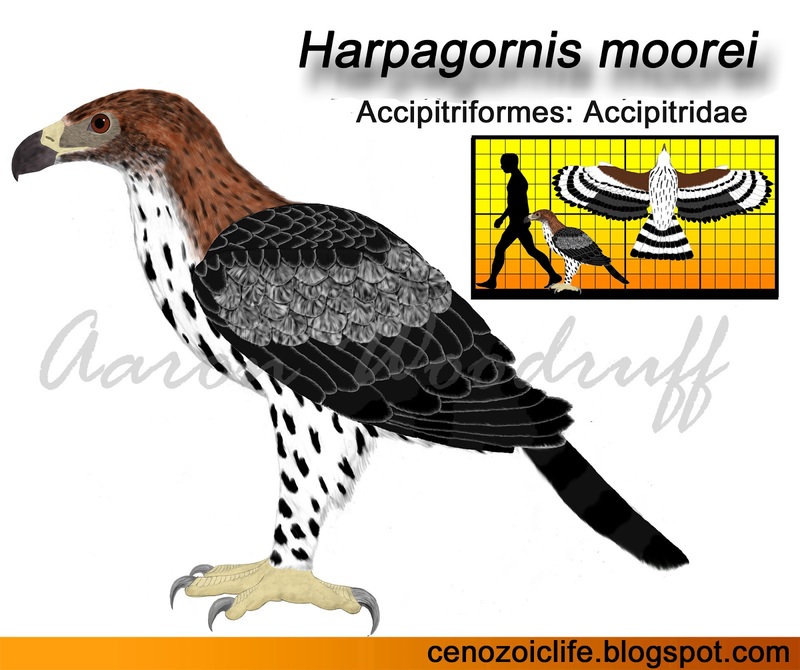 The genus name Harpagornis is derived from the Greek words “harpax”, meaning “grappling hook” (a reference to the bird’s huge talons) and ornis, meaning “bird”. Other names for this species include “New Zealand Eagle” and “Giant Eagle”. 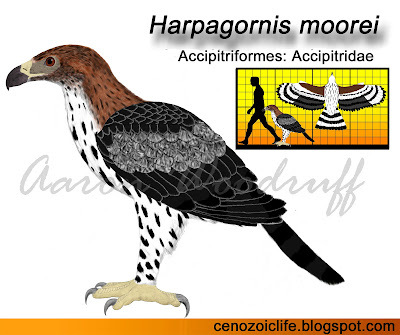 A second, smaller species (H. assimilis) was described by Haast in 1874, but is now known to represent the male morph of H. moorei. The Poukai, a large and aggressive bird described in centuries-old Maori folklore, is widely accepted to be synonymous with the Haast’s Eagle. Haast’s Eagle fossils have been found throughout South Island but is not known to have lived on the smaller North Island. It inhabited forest, woodland, and shrubland habitats from sea level up to the subalpine zone. Genetic evidence shows that Haast’s Eagles evolved from Australian Little Eagles (Hieraaetus morphnoides) during the early Pleistocene, demonstrating what is perhaps the most rapid evolutionary size increase yet documented. In response to an abundance of large prey and lack of substantial competition from other predators, these birds ballooned to over 20 times in mass within the span of perhaps a few thousand years. Haast’s Eagle is the largest and most powerful bird of prey ever known to have existed. Adult females had a weight range of 10 to 18kg (22 to 40lbs) while the smaller males had a range of 9 to 12kg (20 to 26lbs). 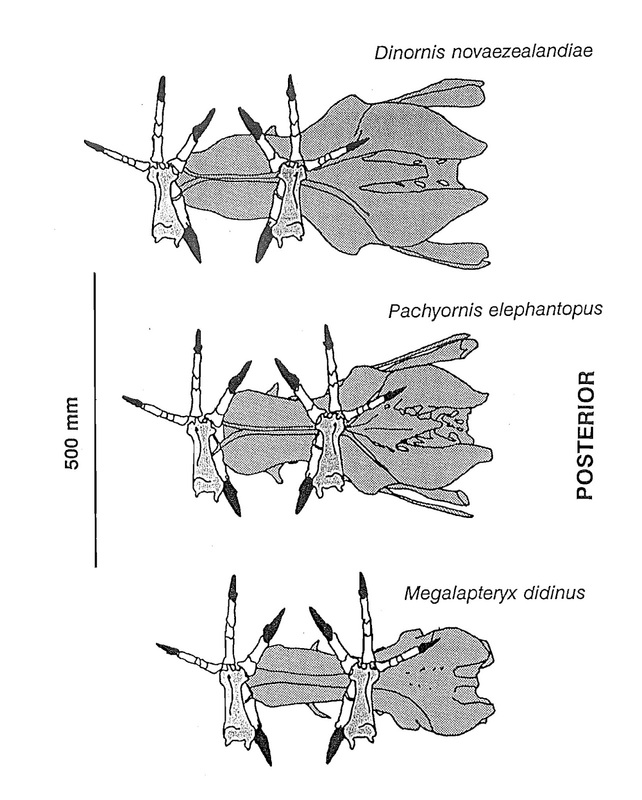 The wingspan was short compared to the size of the body, but was still a respectable 2.6 to 3m (8.5 to 10ft). Although this wingspan is matched or exceeded by several modern birds including several eagles and vultures, it should be noted that their bodies are proportionally much smaller with longer wings, making them much less massive. Haast’s Eagles flew in a manner similar to modern large, forest eagles such as the Crowned Eagle (Stephanoaetus coronatus), Harpy Eagle (Harpia harpyja), and Philippine Eagle (Pithecophaga jefferyi): utilizing constant flapping with occasional spurts of gliding. The shortness of its wings made the energy-conserving soaring flight employed by most large birds impossible, but instead enabled greater speed and agility at the cost of higher rates of energy expenditure. Based on its body proportions, Haast’s Eagle is interpreted as an ambush predator capable of short bursts of very rapid and agile flight, enabling it to maneuver through closed environments and chase terrestrial prey animals which were equally agile. its closest living relative the Australian Little Eagle. 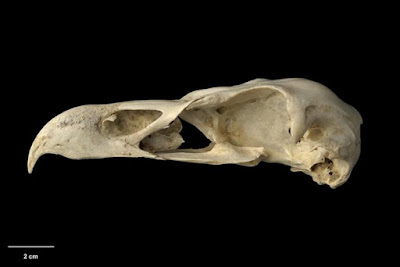 The Haast’s Eagle skull was more similar to that of a vulture than to other eagles: it was relatively long and low with sealed nostrils to prevent the airways from being clogged while feeding within large carcasses (other eagles feed by pulling at the exterior of a carcass and do not immerse the beak and head into the prey's body cavity the way vultures do, therefore this added nasal protection is not needed). 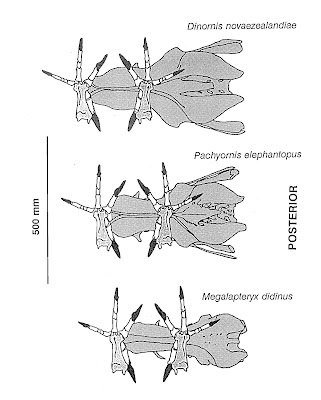 The postcranial skeleton was more powerfully-constructed than those of other eagles. In particular, the bones of the legs and feet were tremendously robust and capable of exerting massive gripping strength. A strong pelvis and huge leg muscles enabled them to spring into the air from the forest floor, absorb the impact of landing and colliding with prey, and grapple with struggling animals. The talons, which measured up to 8cm long without their sheathes, were deeper at the bases than those of other eagles for greater durability and strength: the bones of several moa have been found with high-impact puncture and gouge wounds in their pelvises which could only have been left by this eagle’s talons. Because of its recent extinction, descriptions of the eagle’s life appearance can be gleaned from the oral traditions passed down by the Maori. The Poukai is described as a black and white bird with lighter-tinged feathers, and reddish feathers covering its head and neck. 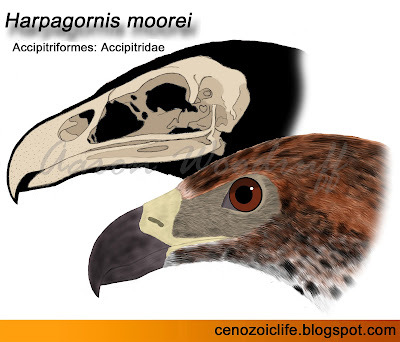 This description, along with the modern Little Eagle as a point of reference, was used to produce the life reconstruction below. Ancient rock paintings depicting large, eagle like birds are also thought to represent this species. The Haast’s Eagle is one of only two known birds of prey which evolved to be the largest and most dominant predator within its environment, the other being the modern Philippine Eagle which also evolved on islands without large mammalian competitors. 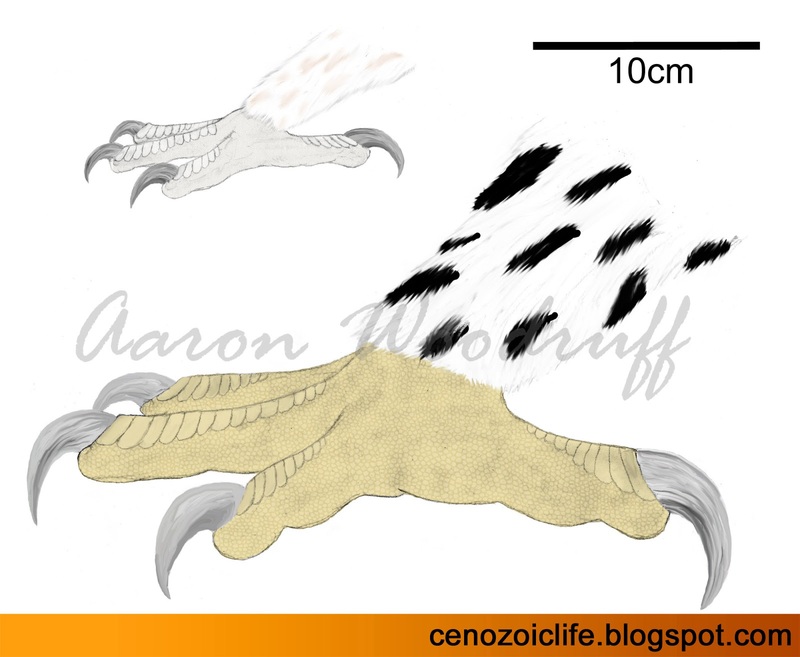 Unlike its smaller relative, however, Haast’s Eagle was adapted to actively hunt prey items much larger than itself and had a prey base consisting of terrestrial vertebrates weighing 10 to 200kg, with a possible preference for items of intermediate size within this range. Most common among its prey were the 7 species of moa with which it coexisted on South Island. 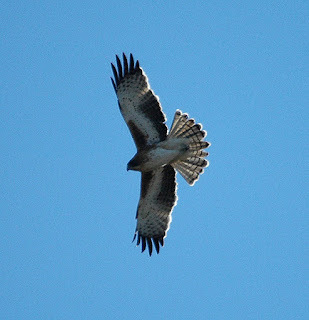 Haast’s Eagles were best suited for “perch-hunting”, a method which entails flying from one perch to another to scan the surrounding area for potential prey. Prey is then ambushed from above and seized from behind or from the sides at speeds of up to 80km/h (50mph). Damage patterns on moa skeletons show that the eagle typically attacked by striking the pelvis with enough force to puncture the bone. An impact in this part of the body would paralyze, knock over, or impair the movements of a bipedal prey item depending on its size before it was dispatched by having its neck crushed in the eagle’s talons. Hunting methods would have varied depended on the type of prey and on the environment. Modern eagles, for example, are known wait for prey at water sources, knock animals off cliffs (video), and even engage in cooperative tactics when hunting in more open areas (video): such adaptability was possible for the Haast’s Eagle as well. Haast’s Eagle fossils have also been found in natural predator traps where they attempted to kill or scavenge prey animals before becoming trapped themselves. severe injury and immobilization. Figure 12.20 from Holdaway,1991. In general, modern eagles select prey animals that they can kill or restrain quickly and transport out of reach of terrestrial competitors. Because of its status as top predator and owing to the sheer size of its prey, however, Haast’s Eagles could afford to remain on the ground near their kills for days until the carcass was fully utilized. Such large kills raise compelling questions about this bird’s social behavior: a particularly large moa carcass would probably decay beyond consumption before a single eagle could fully utilize it. Therefore, Haast’s Eagles may have lived and hunted in pairs, which is a behavior adopted by modern eagles. Like other large eagles, Haast’s Eagles probably laid 1 or 2 eggs at a time with both parents participating in the incubation and feeding of the offspring, which would have grown rapidly over the next few months after hatching. The unique hunting method which these birds employed may have necessitated extended periods of juvenile dependency beyond the typical one year it takes for modern large eagles to make their first kill, potentially remaining within or near their parents’ home range until they reached sexual maturity at 6 to 8 years of age. Haast’s Eagle fossils are rare, suggesting that they had relatively low population densities like modern forest eagles. One study estimated that the available land area of South Island could have supported a total population of 3,000 to 4,500 breeding pairs. This combination of low population density and slow reproductive rates is ideal within a stable island environment, but it also left the eagle highly vulnerable to ecological disturbances. The extinction of the Haast’s Eagle is directly attributable to the over-exploitation of its preferred prey and the controlled burning of its habitat by Maori settlers about 500 years ago. Tools fashioned from the eagle’s bones have been recovered from archaeological sites, although it is unlikely that humans hunted these birds directly. Rather, Maori oral tradition suggests that they would have been understandably fearful of it. Like a big cat or a Polar Bear, the Haast’s Eagle was the top predator of its environment and thus would not have been fearful of humans upon first exposure. It also specialized in hunting bipedal animals up to 200kg, and likely saw humans as a potential food source rather than a threat. Indeed, the Maori have described the Poukai as a man-eating bird that would spring upon unwary humans from the trees (which has been depicted in the scene from episode 3 of the documentary Monsters We Met embedded below). Nonetheless, the ecological damage caused by human activity caused the rapid decline of this eagle across South Island. It is also eluded to in Maori oral traditions that the last individuals survived longer in the less habitable montane regions before these isolated populations also became extinct.